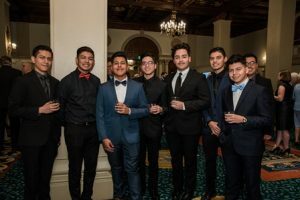 On March 7, 2019, at the Biltmore Hotel, in Downtown LA, Verbum Dei High School produced the “best ever Verbum Dei event,” according to most of our attendees—sponsors, volunteers, faculty, and staff. They said they loved the interactions with the students, who were networking and passing out their own business cards. Guests also enjoyed the VIP reception. Finally, they said they enjoyed the program, the videos, the student involvement, and ending the program “at a very reasonable time.” How and why did this happen? We hired a consultant who pushed us to do things that were uncomfortable for us, but in the end proved that they were for the best. Our event honoree, Joe Viola/Crescent Capital, and co-chair Phil Hosp, were incredible with their support, efforts, time, and energy. We involved the student body in the evening’s program far more than we have ever done before…in fact, our emcees were students!! Last but not least, the Mission Advancement team came together and rallied around the effort like never before, led by Stephanie Andrade, Michelle Cordova, and Annie Levine. Simply put, we have assembled the dream team. We acquired 121 new Verbum Dei supporters! Stay tuned for next year’s Spring Gala, as we can guarantee it will be bigger, better and of course the best event you will attend in 2020! Yes, the Dream Team has already started planning it!!P.S. Thanks to all of the staff and faculty, volunteers, supporters, parents, those who attended and those who couldn’t make it, but were there in spirit. It was a smashing success thanks to you all! !